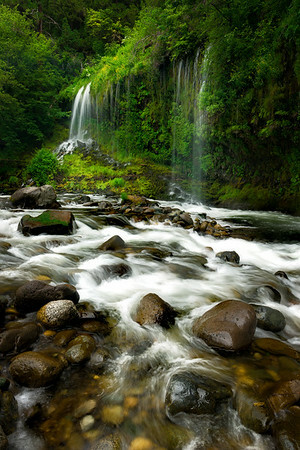 Having previously been to Mossbrae Falls, I decided to take some friends there on the way back from a photo trip. Since this was a return visit for me, I wanted to find different inspiration then the classical weeping wall photo. With those goals in mind I found this view; looking upstream at the two of points where the water first emerges from the canyon wall and meets with the Sacramento River.